Towards the end of the previous video we had created a single route which, when accessed, would render out the contents of our template (e.g. the hello_page.html.twig), and return that as the body of the Response. Whilst we didn't need to create our own Controller class, or controller method (in prior Symfony versions most often called an Action) to make this work, we did use a Symfony provided Controller (TemplateController) and Action (templateAction) behind the scenes. I also mentioned that in 99% of cases, you would likely not work in this way, in the real world. Still, it is interesting to know of this feature, and also it saved us from having to do anything more than we otherwise had to, in order to get started. Lets now create our own Controller class, and in that controller we will create our very first controller Method. There are a bunch of ways to create a new Controller class. What this means is we can type in php bin/console make:controller, and follow the prompt to create a basic controller, and a 'demo' action. Now if we look in our app, under the src/Controller directory, we do indeed see WelcomeController.php. I've taken the slight liberty of adjusting the formating of the return statement for ease of reading. The actual generated code will be on a single line. There's a bunch of interesting things happening in this code, and whilst it would be cool to dive into each part, it would also make things more complex than they need be at this point. Removing use Symfony\Component\HttpFoundation\Response; is easy enough. It's unused, so we can simply delete the entire line. I'm not sure why it's provided in the generated output, and it may not be in future versions. Whilst not something we will immediately cover, this is a recommended Best Practice for Symfony Controllers. We'll cover what this change does a little later on. This routing annotation maps the route or path of /welcome to the index method. Geek Trivia: If you're coming from Symfony 2 or Symfony 3, you may wonder what happened to the Action suffix, as in indexAction. This is possible as our WelcomeController is a service. It's not immediately obvious, but the new route is at the top, and our existing route is at the bottom. Let's set our new controller action to respond on the root of our site. In other words, let's set this controller to respond to /. Don't hesitate to re-check the output of bin/console debug:router when making changes. If you see the change in your console output, you know Symfony understood and accepted your change. Next, rather than rendering out the generated template, let's create a new one of our own. 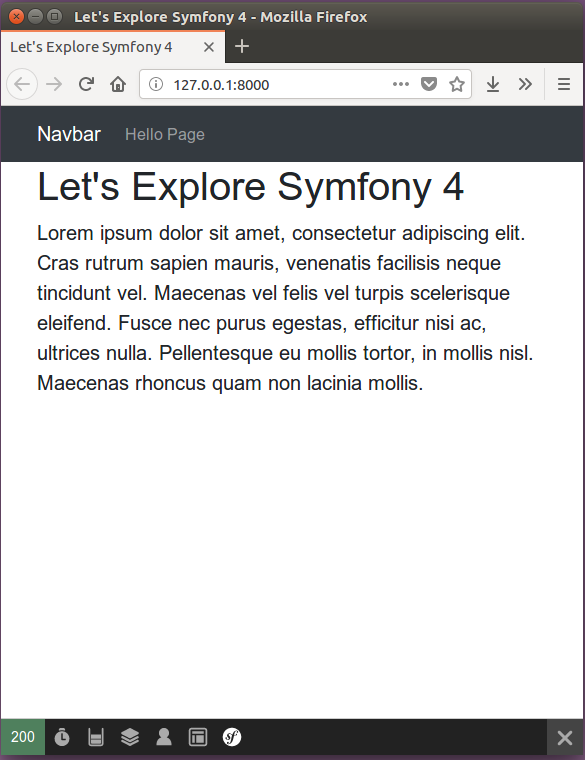 We're going to make use of Bootstrap 4. Feel free to change this up to be any CSS framework you like. Or just skip the CSS, if visuals aren't your cup of tea. This name matches that of our Controller method, but it doesn't have to. On bigger projects, a naming convention like this will make your life a little easier. Use whatever you see fit, of course. It would be nice to push the h1 down a few pixels. We could add that as a style element direct to the template, but a better way is to move styles out to a separate file. We need our style file(s) to be publicly accessible, so that means they need to live in the public directory. Remember, touch is just a nerdy way to create a new, empty file with the given name, from the CLI. Feel free to create the directory, and the file from your IDE. This won't just work. We need to tell our template about our stylesheet. I'm going to add my custom stylesheet entry just above the closing head tag. This ensures the Bootstrap CSS is run first, then my custom styles are applied "on top". Notice that the stylesheet is not using a hardcoded path. Instead, we can use the asset helper function to let the Asset Component take care of figuring out where our resources are located, which is super useful when our template setups get more complicated. By using the symfony/website-skeleton we do already have access to a more full-featured front end assets management library: Webpack Encore. We aren't using this just yet. You don't always need everything the framework provides, so don't feel you have to use all the shiny stuff. Just use the bits you need. Symfony 4 best practices for front end asset management (think: JS and CSS, amongst others) is to use Webpack Encore. Try using the documentation, switching from our current CSS approach to using Webpack Encore. What other tools / software did you need to install? Was it worth the extra effort? Consider leaving a comment below sharing your opinions and experiences. We have Home, which uses the site root (/), and our hello page on /hello. Remember earlier how we changed the route path from /welcome to /, but kept the route name as welcome? Well, one of the nicer parts about Twig is that if we don't hardcode our links, but instead, use the link's name, then we can easily change our paths without worrying about breaking our site. Both path and asset are just some of the many available functions inside your Twig templates. Some you will use more than others. You can test out how useful this is right now by changing the path of your hello_page to something other than /hello. As soon as you do this, and refresh your browser, you will see the link updates automatically to use the new path. This will keep working as long as you don't change the route's name. If you do change the name, be sure to update any path function calls in your template(s). One kinda glaring problem right now is if we browse to the site root (/) we have a nice Bootstrap 4 page with our navbar, a dash of styling, and we feel quite good about ourselves. Then, we click the "Hello Page" link and boom, no styles, no navbar, and the only way out is to hit the back button. Wouldn't it be nicer if our "Hello Page", and any subsequent pages we add, all re-used the same basic layout? Let's explore how we can do just that, and more, in the very next video.